The City of Oakland is undertaking a project to restore and seismically retrofit the historical landmark Leimert Bride that connects Park Boulevard and and Oakmore neighborhood, stretching across Sausal Creek. 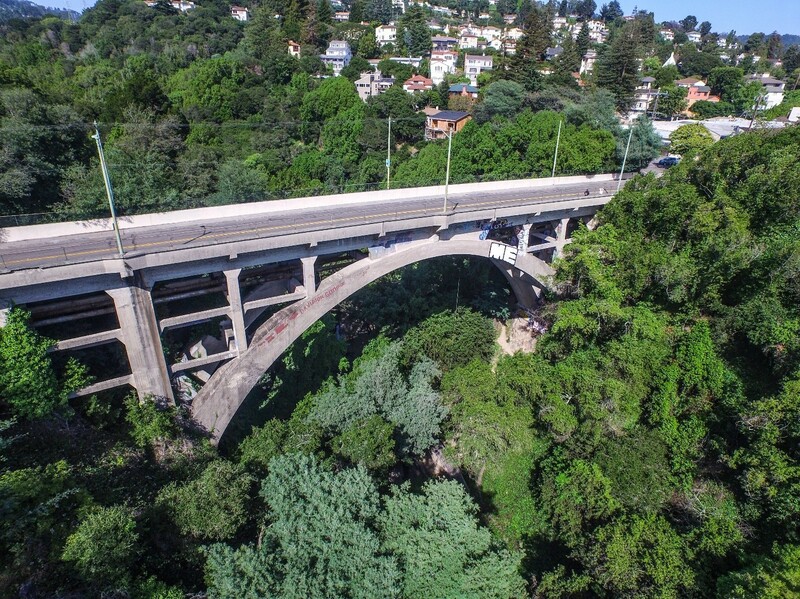 The Leimert Bridge spans 357 ft. across Sausal Creek over Dimond Canyon connecting Park Blvd. to the Oakmore Neighborhood. The bridge was originally built in 1926 and later given landmark status in 1980 by the City of Oakland Landmark Advisory Board. It is also currently eligible for listing on the National Register for Historic Places. The Leimert Bridge was added by Caltrans to a mandatory list of bridges requiring seismic retrofitting after the 1989 Loma Prieta Earthquake. In 1997, a seismic retrofit design was proposed which called for circular steel casings around all of the columns and bases of the arch, and removal of all the original horizontal concrete braces. Because this seismic retrofit design would have had significant impact on the historic status of the bridge, the Oakland Landmarks Preservation Advisory Board (LPAB) and State Historic Preservation Office (SHPO) rejected the proposed retrofit plans. During mid-2015 the City solicited engineering firms to provide a new retrofit design and concepts for the Leimert Bridge that would maintain the historic status of this local landmark. The proposed seismic retrofit preserves all original structural members while enhancing the structural capacity by use of carbon fiber wrap technology. The project Seismic Retrofit Strategy Report has been completed and is approved by Caltrans. The project environmental technical studies are anticipated to be completed by the end of February 2019 with the issuance of CEQA-Categorical Exemption and NEPA-Categorical Exclusion environmental clearance documents. Upon the receiving environmental clearance, the project will proceed with the Final Design and Right-of-Way phases which are anticipated to be completed by the end of 2019. This work is performed in conjunction with Caltrans, the City of Oakland Planning Department and the City of Oakland Landmarks Preservation Advisory Board. The City of Oakland thanks Leimert Bridge and roadway users in advance, for their patience and cooperation as we continue to enhance and strengthen critical links such as this to withstand earthquakes. Access to the Oakmore Neighborhood and seismic safety of our infrastructure are critical for Oakland residents. We will do all we can to minimize inconveniences over the span of this project.